Are you worried to leave your home unattended as you go to work or on a trip abroad? Going away without nobody trustable to guard our home is indeed a worrisome issue. We will not be able to enjoy our trip or focus on our work if our mind continuously wonders about the safety of our home. That is why we need a wireless surveillance cam. With such device, we will be able to monitor the condition of our home remotely, no matter where we are and what time it is. Preferably, the cam should also be a smart piece of hardware that can notify us about the things happening at our home and integrate well with our smart home system. Belkin Netcam is one nice example. If you are looking for an affordable wireless smart cam with surveillance capabilities and smart home features, this is the answer. Available for a budget around a hundred bucks or so, Belkin Netcam is quite more affordable compared to the other competing products. However, it has been well feature-packed. It offers motion-activated recording, email notifications, as well as cloud storage for playback from anytime and anywhere. However, the most distinctive feature of Belkin Netcam is its ability to integrate with WeMo smart home accessories. A smart cam for a smart home. Belkin Netcam comes with a simple, compact design. It is barely the size of an iPhone 4, and there is an adjustable stand on the back. Thanks to the small form factor, Belkin Netcam is actually easy and flexible to place. The mini ball head-mount joint between the camera and the stand provides 360 degrees horizontal and 90 degrees vertical rotation. The mounting plate allows you to attach the cam to a ceiling or a wall using the provided screws. It doesn’t appear very salient if you put it in a room corner or on a shelf. Also on the back panel, there are the control buttons, indicator lights, and a mini speaker. The 2MP camera is on the front panel, directly below the light sensor and above the infrared LED that is used for illumination at night. Also at the bottom of the front panel is a built-in microphone. Belkin Netcam is without Ethernet or any other wired connectivity options, relying solely on the simple Wi-Fi setup. As the effect, the design of the camera is much more streamlined, but it is impossible to use without Wi-Fi. The field of view is quite wide, able to capture the whole of a room easily. The maximum resolution is 720p, which is already great for a surveillance camera. However, streaming on the 720p resolution may cause latency issues and lagging if your connection speed is not very good. Using a lower resolution solves the problem. In daytime, the images are crisp and detailed and with vivid colors. At night, the infrared vision performs an excellent job. Belkin Netcam provides fairly good illumination that allows you to see clearly the room, although dark-hued objects are still kind of blurry. But this should be sufficient to detect and capture if there is an intruder. Belkin Netcam comes with a mobile app, through which you can remotely adjust various settings, such as the sensitivity of the motion sensor and the video resolution. There is a cloud service that you can utilize to store the recordings, but this service obviously requires a monthly or annual charge. But this service can be well worth the money, especially because it also provides real-time push notifications to your smartphone. But, don’t worry; Belkin Netcam can send email notifications instead if you are not interested in using the premium service. Having a mic and a mini speaker, Belkin Netcam can also provide two-way communication. And, by using the WeMo app, you can set rules to control the behavior of your WeMo smart home accessories as well as their integration with Belkin Netcam, effectively transforming the camera into an advanced home-automation system! 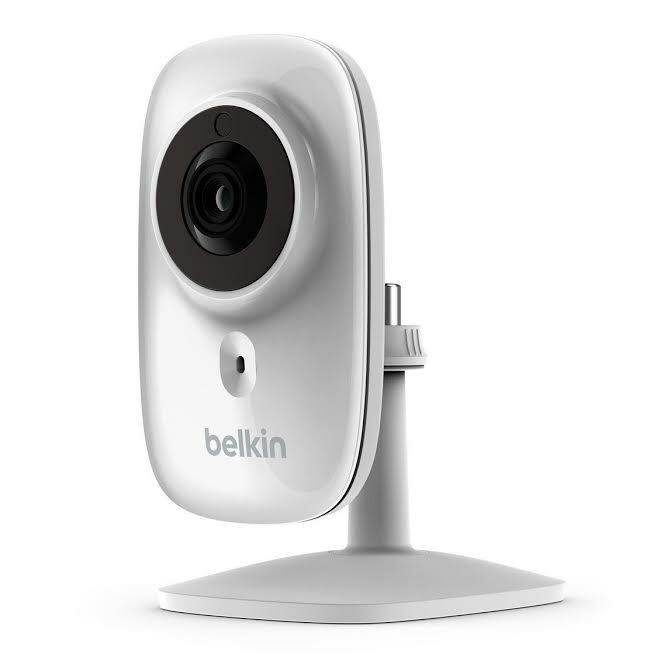 Check the best price of Belkin Netcam here!